DES MOINES, Iowa, USA, Oct 19 2012 (IPS) - In a major endorsement for investment in women – the bulk of food growers in the developing world – United Nations Secretary General Ban Ki-moon said food security could not be achieved without women, and that the world’s hungry also needed leaders to prioritise actions. “Girls and women are society’s best chance to overcome hunger,” Ban told a gathering of world leaders, researchers, farmers and policy-makers at the presentation of the 2012 World Food Prize. Global leaders meeting in the midwest U.S. state of Iowa to discuss strategies to boost food production worldwide say the particularly challenging food security situation in Africa will require mobilising the continent’s best scientific minds, including those of African women. “Ending hunger in our lifetime calls for harnessing the creativity of scientists and researchers…ending hunger also calls for better global governance…Ending global hunger can be done and is the right thing to do,” Ban Ki-moon said at this year’s ceremony for the World Food Prize, an international award recognising the achievements of individuals who have advanced human development by improving the quality, quantity or availability of food in the world. Calling for global cooperation in providing leadership in food security at a time when nearly one billion people go to bed hungry according to the Food and Agriculture Organisation (FAO), Ban could have been talking about African Women in Agricultural Research and Development (AWARD). This week, AWARD, celebrated for working to increase the number of women researchers and scientists in agriculture, received close to 20 million dollars in new joint funding from the Bill & Melinda Gates Foundation and the United States Agency for International Development. The support announced at the Borlaug Dialogue, held Oct. 17-19 in Des Moines, Iowa, will allow AWARD to launch a second five-year phase to equip more women agricultural scientists in 11 sub-Saharan African countries, in addition to the hundreds of researchers already served since 2008. Only one in four agricultural researchers in Africa is female, according to AWARD’s 2008 benchmark study. But it gets worse: just one in seven holds a leadership position in African agricultural research institutions. AWARD founder Vicki Wilde said this has left women underserved in the agriculture value chain and therefore in a weakened position in the fight against hunger. Wilde said women were not at the decision-making table on food priorities. She added that although bringing them on board is not the answer to every problem, it would ensure better and faster progress, and small-scale farmers – a majority of whom are women in Africa – would be better served by means of boosting food production and enhancing livelihoods. “In Africa we need a new generation of leaders who are innovative, visionary, entrepreneurial, well-skilled and gender-responsive, and they have to respond to the priority needs of small-holders, most of whom are women,” she said. AWARD, commended by major organisations at the Borlaug Dialogue, is a competitive programme which this year has seen 3,000 applications from African women scientists for 320 available fellowships. 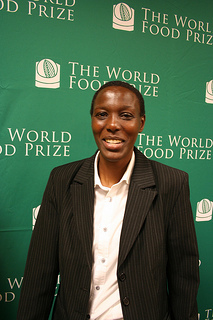 Wilde said her organisation has sought to widen the talent pool of implementers of effective food security policies. AWARD is a career development programme that strengthens the research and leadership skills of African women in agricultural science, empowering them to contribute more effectively to poverty alleviation and food security in sub-Saharan Africa. It offers two-year fellowships focused on mentoring partnerships, science skills and leadership development. African women working in agricultural research for development from Ethiopia, Ghana, Kenya, Liberia, Malawi, Mozambique, Nigeria, Rwanda, Tanzania, Uganda and Zambia, and who have completed a bachelor’s, master’s or doctoral degree in selected disciplines, are eligible. Mary Njenga, an AWARD fellow from Kenya, is one woman with her sights set on changing policies and mindsets about the role of women in food security. Njenga, an environmental scientist linking agriculture to environment and energy issues, has focused on improving natural resources management to mitigate climate change. She has done this by bringing technologies such as environmentally-friendly, simple fuel briquettes made from charcoal dust, sawdust and other organic by-products to poor community-based groups. “I can work with women and come up with good technologies, but if I do not have a voice with policy-makers, my technologies will remain in the books and not be adopted,” Njenga told IPS. Njenga, a PhD fellow at the University of Nairobi working in affiliation with the World Agroforestry Centre (ICRAF), said she was concerned about developing clean fuel briquettes to improve women’s income and protect their health and that of their children while conserving the environment. “I am worried that we may reach a situation where in sub-Saharan Africa we will be able to produce food but fail to cook it because of a lack of cooking fuel; therefore it is a must that we prioritise biomass cooking energy as an important aspect of food and nutrition security,” Njenga said. Roy Steiner, director of agricultural development at the Gates Foundation, said the AWARD programme and the fellows involved helped ensure that women were at the heart of agricultural development, advancing research and innovation to reduce hunger and poverty. Another AWARD fellow, Professor Sheila Okoth of the University of Nairobi, has contributed significantly to reducing hunger through her research on solutions to combat contamination by aflatoxin, a poison produced by a fungus, of farm produce in Kenya. Okoth established the university’s first post-graduate mycology research lab, inspired by her three-month advanced science training at Stellenbosch University in South Africa, which was sponsored by USAID through AWARD.